Only one game today at Strahov Stadium, so we arrived early for a leisurely preparation. We sunscreened with our non-throwing hands and donned the dark blues. During our warm-up routine the wind picked up in a downfield direction, but otherwise the sun baked the rubber pellets in the field turf for a hot, fast playing surface. We rained five pulls out of bounds this game, a mistake that we generally pride ourselves on avoiding. The wind wasn’t bad enough to excuse them, though it never should be, so we tuned them at half-time (9-1) and got back on track. #12 Nick Chapman caught a couple of deep goals by generating separation with his legs. The O-line continued to excel in their occasional employment, still without allowing a break during the first two days. Both O and D-line offensive units did move the disc quickly all game, if not always efficiently, as we wrapped up a 17-3 victory to win Pool B. #17 Lewis Glover of Fire received a dark blue Revolver jersey for his calm, collected, handler distribution and a couple of athletic grabs. Thus Revolver advances to Power Pool P, where we will face five opponents over the next three days. We only know our schedule for tomorrow, though: the winner of Pool E and our fellow countrymen, Sockeye, in the morning and the runner-up of Pool D, M.U.C. in the afternoon. Most of the team rode the funicular down the hill from the stadium, walked over the Charles Bridge, and lunched near the river (meals generally cost less on the old town side rather than the castle side). Later a gang watched Doublewide (Houston) defeat Euforia (Colombia) in the showcase game before heading back to the hotel for a team meeting and fitful night’s sleep. All 26 players arrived yesterday at Hotel Rhea and gathered for a team meeting to review logistics, distribute this season’s new Patagonia jerseys, discuss strategy for Sunday’s games, and generally check in about the team’s mental fitness. This morning we rode the tournament buses across town (if you can call the metro area of nearly two million a “town”) and over the Vltava River to vast Strahov Stadium, which reportedly holds 220,000 people. The plush grass felt really comfortable under bare feet, but the time had come to cleat up. Nick Handler looked anxious to get back into action with the team he founded five years ago, fresh off a year and a half working for a non-profit in Kenya. youngster (can’t remember his number, but he wore a soft white helmet) that had made a fabulous stretching layout for a goal in the second half. We hydrated and ate quesadillas from a stand across from the stadium for lunch and sought out a shady perch in the stands to observed Chain Lightning vs Ultimate Decision (Latvia), which was relatively one-sided after they traded to 3-3. Everyone took turns with the vuvuzela–it’s tougher than it looks! James Herbert and Martin Cochran gave especially strong performances, demonstrating quite a range of sound. We know what you’re thinking… site down vuvuzelas have a range? Several athletic Ds by #7 Russell Wynne and smooth offense after the turn by #27 Ashlin Joye helped power Revolver to a 17-1 victory (9-1 at half) in our second game. #11 on Gigolo earned himself a long-sleeved light blue jersey by virtue of generally gritty defense and a couple of nice offensive contributions including a tight but crisp up-the-line backhand huck. 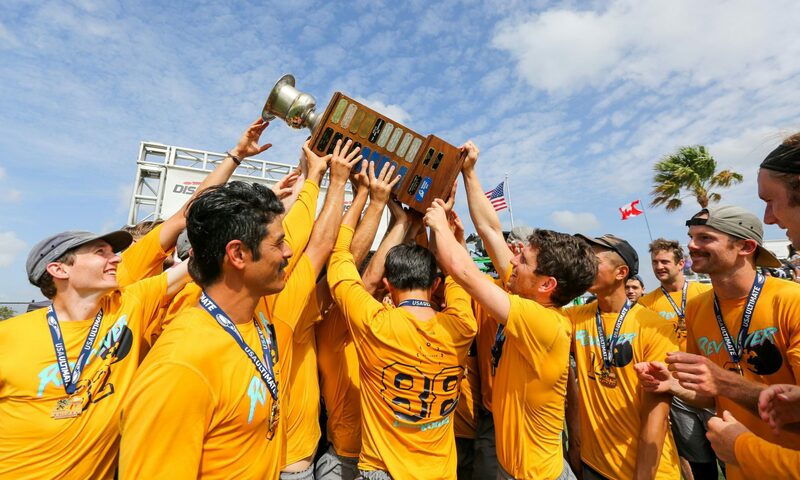 We learned later that Gigolo is a combination of two Ukrainian teams, since they primarily play beach Ultimate, which requires fewer players than proper for a seven-person week-long tournament on grass. A fun game fought hard on both sides.